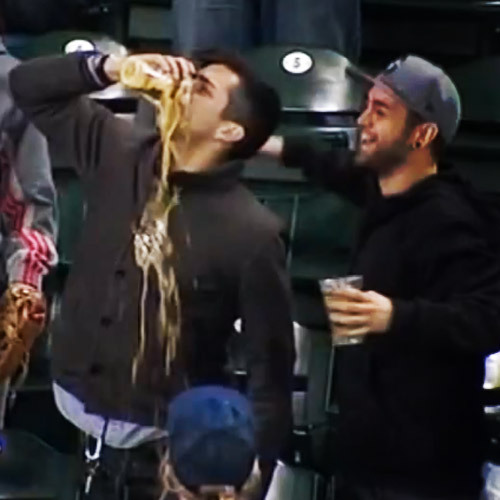 By now, you may have seen the video of a Mariners fan catching a foul ball in his beer and then chugging down it like a gladiator at the Colosseum. If not, I’ve posted the clip below. The beer-baller gets style points for sure. 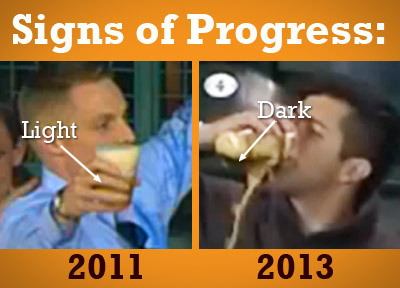 Not only do we see richly tan foam splashing down his chest, a closer look at his beer shows is dark brown. That ain’t no Coors Light in his hand! Just about two years ago, we shared a video of a Red Sox fan catching a foul ball in his beer cup and drinking it like a man. Back then, the beer was very pale and fizzy, not rich, dark and foamy. It look like better beer might be becoming as American as apple pie and, well you know, despite the fact that some ballparks (*cough* Yankee Stadium *cough*) don’t seem to know what REAL craft beer is! ← Did the Craft Beer Bubble Burst (in 1997)? Safeco Field (and I’m sure many others) is a completely different experience than Yankee Stadium or Citi Field when it comes to beer. In NY (at least a couple of years ago), you have to seek out a special beer stand to get anything other than a light beer. While they have these special beer stands at Safeco, at every single food vendor they have at least one dark/craft/actually good beer on tap as well, usually a Redhook, Sierra, Fat Tire, Mack & Jacks, etc. But regardless, bravo for this chap for picking one of the good ones! Whenever I’m home in Seattle in the summer I try to get to a game at Safeco, and I’m always overjoyed at the incredible beer selection, at least for a ballpark. I also just want to point out that this man is my hero, and you writing this post up makes me incredibly happy. I mean, it is the Pacific Norhtwest. They know beer in that region. Obviously – even the baseballs love it up there! Nice article here about the beer at Comerica Park (Detroit). I haven’t been there yet this year, but sounds like they’ve even made an improvement over the good selection they had last year. Classic – now THAT’s a Freakonomics lesson right there. No need to dive into the sales data to identify trends. I was going to say something about the higher craft beer IQ of the Pacific Northwest baseball fan but Zac already covered it. That said, not the smartest move using the beer as a glove. Knowing enough to buy better beer should carry through to knowing enough to drink all of the beer you buy – not use it for style points and your YouTube moment. I remember when I was 12, our family went to a Brewers game in old County Stadium. We had just moved to Wisconsin. A guy caught a foul ball in his beer and got a standing ovation, probably the most noise the fans made that day. I sort of feel like that tells you all you need to know about baseball in the state of Wisconsin. Although it was almost certainly a Miller or maybe a PBR (this was the 80s, after all). Did the Brewer go down the slide into the giant beer? Because I was there as a kid when he did, and thought it was the coolest thing I’d ever seen!